Food & Wine ’13 Flash Report! – Mongolian Beef | It's "All in WDW"
I feel like this dish is often underestimated. The beef was perfectly done. The sauce was an outstandingly spicy condiment and, much better, even, than the sauce found on Hawaii’s Kalua Pork Sliders. 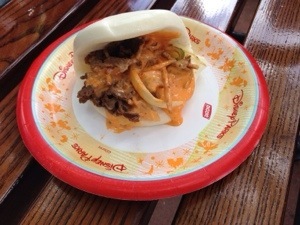 The contrast of the pillowy-soft bun and crunchy Chinese noodles lifts the sandwich to a level of uniqueness that’s unmatched. Can you tell I liked it? Yum! A “must try”.